FOLLOWING a resounding away win over a weakened Avon County, in November, the Cornwall Youth Badminton Under-13 Team, sponsored by Dairy Crest Davidstow, producers of Cornish Cathedral City Cheese, came back down to earth, when they entertained Devon - going down by 24 rubbers to 12, in the South West Counties Junior Badminton League Fixture. In an absorbing encounter, played at Truro School, on December 18, the experience of the Visiting Outfit shone through, with the Devon cream seen to rise to the top, writes John Tresidder, with Kerry Sillifant. The Visitors’ selected a very strong contingent of Boys, especially but their Cornish opponents went down, pluckily, in all the six rubbers. Truro’s Tim Wyatt, went the closest, before losing, 22-20, 15-21, 23-21. The Host’s Girls fared much better, harvesting 4/6 singles rubbers, with their Polly Morris and Flossie Cameron-Webb, both securing victories in a deciding third end of play. Therefore, Devon led 8-4, following the opening singles events, which are always seen to be of a paramount importance, psychologically. The Boys’ Doubles rubbers saw the Tyler Sillifant/Ollie Cavil partnership winning the Duchy’s sole match - against the Devon number thee pair, with Devon securing five rubbers out of six and remaining dominant throughout. However, the Danny Alford/Charlie Newman partnership were seen to go to three exciting games against the Visitors No, 3 team, before going down, narrowly, 21-19, 18-21, 21-18. In the Girls’ Doubles, Kernow fared much better, winning 6/9 rubbers, with strong performances from the Beth Rutter/Sarah Frost and Polly Morrris/Cara Thompson combinations, with Amy Polglase and Flossie Cameron-Webb, taking all of their matches in two straight ends of play. The Mixed Doubles Events, which acted as the culmination, saw the Devon Boys’ strength and experience coming to the fore, once more, to help win five events, with the Duchy’s Tyler Sillifant and Amy Polglase picking up the number one mixed in three games. Congratulations are due to Sam Tucker, who gained his first Cornwall County cap. Finally, the Cornwall Under-13’s hope to return to winning ways, when they take on Somerset, at Truro School, on Sunday, January 29, starting at 12.00 noon. Team co-captains: Tyler Sillifant and Amy Polglase. Team co-managers: Kerry Sillifant and John Polglase. MEANWHILE, the Cornwall Under-21 Badminton Championships, 2011/2012, are being staged at the Tregorrick Parc, St. Austell Rugby Club Sports Hall - tomorrow (Monday, January 2). Singles, Doubles and Mixed Doubles, five disciplines, in total, are on the full programme-of-play, which gets underway at 9.00 am, with supporters and spectators being most welcome, as usual. Johanna Philp, aged 18, a Midwifery student at Truro College and Ross Lashbrook - who turn out for the Cornwall Chiefs - will be defending their blue ribband singles titles. Camborne Science College badminton stars, Amy Polglase and Kellen Moore, aged 12 and 13, respectively, coached by Clif Morcom (Redruth), are both making debut appearances in the Championships. After playing their beloved sport for two years, only, this U-21 Event will prove invaluable in the Girls' remarkable development, including for Miss Polglase installed recently, as the BADMINTON England No 8, in Girls' Under-13 Singles. Cornwall’s best badminton players took on Berkshire, who had made the long journey west, sitting at the top of the Division 3 league last Sunday. This proved a tense, exciting clash of two talented sides battling for supremacy at the halfway stage of the season which kept the crowd enthralled throughout the afternoon. Cornwall made a dominant start in the singles to make it 3-1, after Shane Maton, James Whetter and Jo Philp played superbly to see off their opponents, and Bronwen Wotton just losing to a mobile, tricky Berks player. The Cornish men kept the winning theme going as the established pair of James and Guy Michell powered their way to 2 victories, and Tom Lyle and Ross Lashbrook winning one of their games in fine style before succumbing unluckily to the first mens pair. The Duchy’s ladies were up against it, as Berkshire took 3 of the 4 games, although Jo and Emily James did extremely well to beat the first pair in 3 very close ends, and Bronwen and Vicki Thomas came agonisingly close to winning against the 2nd pair, in a nail-biting 3 ender. 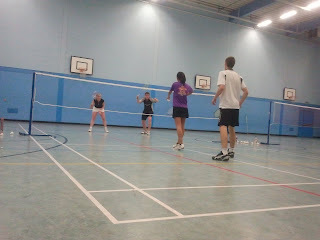 So with the match score at 7-5, Cornwall needed just the one mixed doubles for victory. The watching crowd became more and more tense as Berkshire took 2 of the games to tie the score, and it came down to Cornwall’s top mixed pair, James and Jo to win for the team. This they did, of course, in 3 ends much to everyone’s relief and gratitude – a great win for Cornwall 8-7. This outcome makes the teams tied on top of the Division going into the Christmas break, and makes the second half of the season a mouth-watering prospect. Team – Shane Maton, James Whetter, Guy Michell, Tom Lyle, Ross Lashbrook, Jo Philp, Bronwen Wotton, Emily James, Vicki Thomas. A QUESTION … What do 4.4 million adults across England meet up to do each year to keep fit, healthy, active all while putting a smile on their face, writes Emma Austin. The Olympic sport of badminton of course! For some, playing badminton may still conjure up nostalgic thoughts of playing at school in a cold sports hall or played with the family in the back garden, using the washing line as a make shift net. Badminton may well be still considered that low cost, traditional garden sport that anyone can swing a racket for enjoyment in, but it is a little known fact that more people in England now play badminton than cricket, hockey, rugby union and rugby league put together! Move up the competitive ladder and it’s also the fastest racket sport on the planet with the shuttlecock flying around at over 420 km – that’s faster than an F1 car! It is little wonder that, each week, well over 1/2-million adults head onto the 23,000 plus badminton courts across England - be they in leisure centres, sports venues, schools or community halls - to put their racket skills on show. With such an impressive stat, it is easy to see why badminton is the 6th most popular and frequently played sport in the country - and is no surprise that there is an active badminton club scene in every county. Within Cornwall alone, there are a host of fantastic badminton clubs, thriving at both senior and junior levels, which open their doors wide to welcome new players of any age or on court ability. Yet the numbers of people playing in clubs both for fun and competition across the county do not stack up to the national statistics. For every one club in Cornwall there are five in Devon and it’s starting to have an impact on how the county competes at a local level. 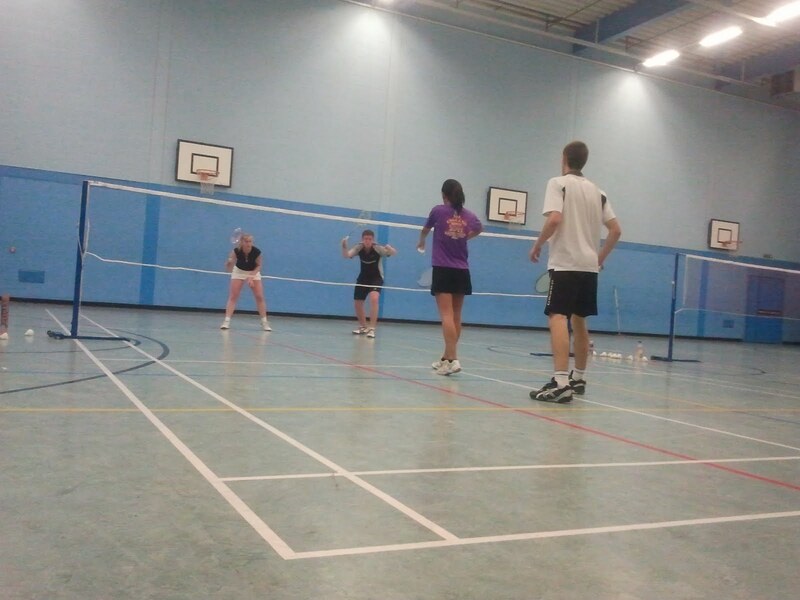 Despite, a hugely sociable affiliated club network and an army of local volunteers offering coaching opportunities, there are fewer players taking part in regular, organised badminton in Cornwall www.cornwallbadminton.co.uk and some clubs are even finding it hard to fulfil local East and West Cornwall League commitments, with female club members a particular issue of concern. For badminton to grow across the county, attracting new adults onto Cornwall’s low cost courts in organised badminton activity is a priority – and BADMINTON England, the sport’s governing body www.badmintonengland.co.uk are committed to heading up the charge, led locally by Emma Austin, the county’s regional officer. Recreational players, who enjoy regular, social badminton with friends or work colleagues are the ideal candidates to join into local clubs and put their talents to the test in some team league badminton. 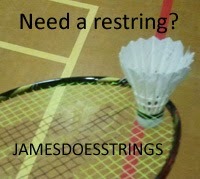 The all new web portal at www.playbadminton.co.uk would be the perfect place to start. Alternatively, current social groups with a regular player base, could affiliate as a club and enter the East and West Cornwall Leagues. And for those not quite ready to step up and play competitively where points make prizes at the end of each season, there are now a host of extremely sociable court time initiatives springing up across Cornwall to get adults onto court. Look out for No Strings Badminton, a national programme with over 260 venues and five major leisure chains involved, offering low cost pay and play sessions at times that actually suit busy lifestyles. “With No Strings Badminton we’re taking away a lot of usual barriers when it comes to getting back involved in sport. There’s a guaranteed playing partner at every session in Cornwall so you are always assured of a game and you can just turn up, there’s no need to book,” continued Ms. Austin. Badminton is a fantastic sport for all – at whatever level, it is a game for life. So, why not give it a go in 2012 and see what all the fuss is about! “I have taken part in a number of sports and was a county schools’ sprinter, but badminton, one of the World’s most popular participant sports, is the one that I love the most. “We are an exhilarating sport, where athleticism, poise and balance is allied closely to fine touch and power. 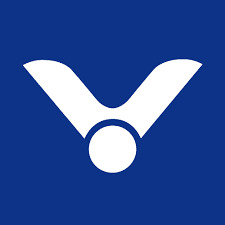 In addition, in a rubber of singles badminton, which goes to a deciding third game, a player travels farther, in a match, than in any other sport, apart from ice-hockey. “I feel our great sport, comprising a game of aerial rallies, in effect - unlike tennis, table tennis and squash, all good sports, as well, who have the luxury of a bounce - has the potential to be very popular at club and league level. 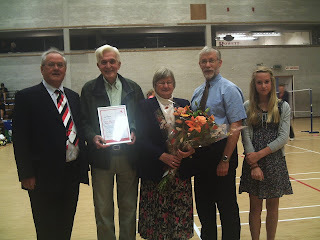 “Indeed, I discovered, fairly early on, that a badminton club affords great camaraderie and where one can bid for selection to a representative team in the league, with organised pathways in to Cornwall Youth Badminton (CYB), as well as senior county and international level badminton. Inter-Club “Friendlies”, are also a consideration for those not so ambitious, when starting out. Emma Austin and John Tresidder. Cornwall’s top badminton team maintained their winning ways, with an excellent home victory over the visiting Somerset team at Polkyth last Sunday (4th December), 11-4, gaining maximum points and moving them to second in the league behind the powerful Berkshire side, who they play next on 18th December. All four Cornish singles players won, giving a fantastic 4-0 start to the match, 3 of the games going to the wire, with Shane Maton, Jo Philp and Bronwen Wotton being victorious in three close ends, and James Whetter taking his game comfortably in two. James teamed up once again with Guy Michell to power their way through both mens doubles, equalled by the newer pairing of Shane and Ross Lashbrook Both pairs looked impressively invincible and the Somerset boys had no answer to the attacking badminton on display. Cornwall’s ladies doubles players were up against some experienced Somerset girls, who proved too strong for Jo and Rachel Irish, although Bron and Vicki Thomas faired better by just taking an exciting 3 ender against the second Somerset pair, saving match points along the way to the delight of the partisan crowd. Bron and Vicki were unlucky not to push the first pair all the way in their other game. The match score stood at 9-3 going into the mixed doubles – Cornwall having won the match but needing one more game to secure maximum points. All three games went to three ends to keep the watchers on edge, but James and Jo, and Guy and Rachel won through, and Ross and Bron were very unlucky to miss out on winning a fine close game. Congratulations to Shane, James and Guy on their 100% performance, and well done to the whole team for a thrilling result. All spectators are welcome to the final game before Christmas, a potential top of the table clash with Berkshire at Polkyth on 18th December at 1pm. The jubilant Cornwall Youth Badminton Under-13 Team, sponsored by Dairy Crest Davidstow, after defeating Avon County, by 35 rubbers to 1. Cornwalls Under 13 Badminton team made the long journey to Avon on Sunday 13th November for their first match of the season. The team of 6 boys and 6 girls made a fantastic start taking all but one of the singles games, Avon put up a fight but the determination of the Cornish youngsters paid off and they went on to win the remainder of all the doubles and mixed doubles games to take a 35-1 victory. Avon were unable to field a full team of girls so they played 3 players from the girls under 15’s. Beth Sarah and Polly played these singles matches and won them a fantastic achievement. Beth went to 3 ends in her match and showed true determination and focus to emerge victorious after taking the final end 21-18. Danny Alford and Tim Wyatt both in their debuts for Cornwall Successfully won all of their doubles matches again in 2 ends. A Fantastic victory for the Cornish team and a great start to the season. Boys team: Tyler Sillifant (capt), Charlie Newman, Tim Wyatt, Danny Alford, Ollie Cavil and Mark Pearson. The closing date for entries is Sunday September 18th and entry forms can be downloaded by clicking HERE , or from the download section on the right of the Cornwall Badminton website. October the 15th 2011 sees the return of the Cornwall County Badminton Association’s Badminton Bonanza tournament at the 6 court sports hall in Penryn Sports college from 10am – 5pm. This fun tournament will include, singles, level doubles and mixed doubles events, all split into two categories of social and league standard ensuring that players are only drawn against those of a similar ability. 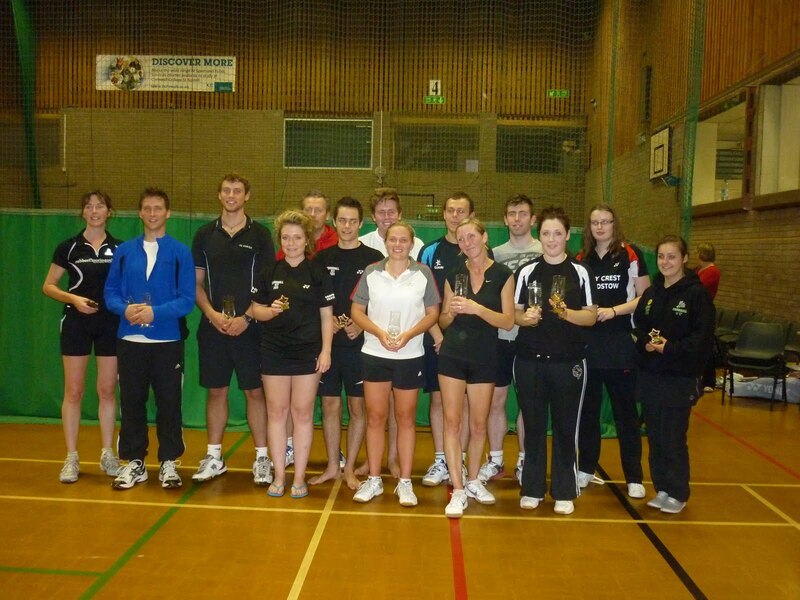 In 2010 the event attracted over 50 entrants from all over Cornwall and parts of Devon, raising significant funds that are to be ploughed back into grass roots community badminton projects within the county. Forms can be downloaded by clicking HERE , or from the download section on the right of the Cornwall Badminton website, or contact Trevelyan Searle - Tel: 01736 798606. PLANNING WELL ADVANCED WITH £1,260 IN THE PRIZE FUND, FOR THIS SEPTEMBER’S EVENT. ANOTHER bumper entry of over 100 players is anticipated for the Duchy of Cornwall 29th “Open” Badminton Championships, with competitors expected to be drawn from a good spread of English and Welsh Counties, once more,writes John Tresidder. 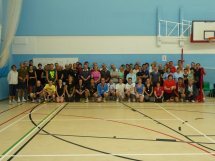 The prestigious Event - known as one of the most enjoyable and best organised in England - A Tournament in the BADMINTON England Senior Silver Circuit, and with the prize-fund at: £1,260, is scheduled for Carn Brea Leisure Centre, Pool, Near Redruth, on the Weekend of Saturday and Sunday, September 17/18. Entry fees have been pegged at the 2010 prices, with the entry forms scheduled to be posted - around 31st July. Graphic Solutions - www.graphicsols.com - the Computer Company, from Farnborough, Hampshire, together with TAG SPORTS - www.tagsports.co.uk, in conjunction with YONEX UK LTD, have once more joined forces as the Tournament’s joint main sponsors. The Countryman Inns Free Houses Group, from Piece, Carnkie, Near Redruth, together Dales Renault, based at Scorrier and Summercourt, are amongst the other generous backers, of the Championships, which are known as one of the best organised and most popular on the English Badminton Circuit. Mixed Doubles Semi-finals and Final, pus Men’s and Ladies’ Level Doubles. There is expected to be a good turn out from Cornwall, the host, of over twenty players, including a healthy contingent of youngsters from the successful Cornwall Youth Badminton Organisation, which is supported by Dairy Crest Davidstow, of the Cornish Cathedral City Cheese. David Burgess, an experienced International Referee, is the official in charge of the play in the hall over the weekend. THE ENGLAND SCHOOLS’ Badminton Championships Finals, 2011, sponsored by Center Parcs GB, were staged at the Company’s magnificent Center Parcs, Sherwood Forest, Nr. Nottingham, on the Weekend of April 3/4. 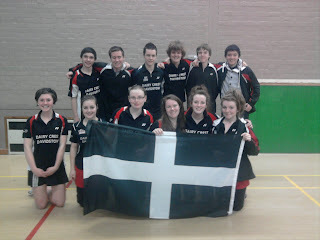 Truro School, who won the South West of England Final, at the University of Exeter, Devon, on March 3, were thus representing the South West of England Region, in this most prestigious of Events, contested at the magnificent venue, managed by the Company, CENTER PARCS UK LTD, BADMINTON England’s main sponsor. As anticipated, the National play, overall, was seen to be of an exceptionally high standard, with some of the Country’s most talented badminton youngsters, including Junior Internationals, competing in the famous Sherwood Forest Hall. On Saturday, the first day, Truro School’s Key Stage 3 KS3. Years, 7, 8 and 9 (Under-14) Team, who are relatively inexperienced at junior county play, played valiantly, but finished ninth out of nine regional schools. However ninth best School in the Country, remains a superb result. The Duchy’s well known School, competing in a group of three regions, won around 50% of the singles games contested, going down in two matches by a single point and five rubbers, by the same margin. Moving on to the play, Truro’s Isaac Barrow and Kieran Westlake Outfit, won all their respective doubles rubbers; thus, having remained undefeated at county, regional and national level, all season – quite some achievement Boys. Meanwhile, Vinodh Arumugam, took the scalp of Michael Taylor, a higher-ranked “Silver” player, from Lincolnshire, before Lancashire’s Mattew Kitteringham and proved to be an inspirational skipper all day, for Truro School. earlier in the day, welcomed all the competitors in the age categories to the Finals, before acting as the Organiser and the Referee. Mr. Brown reported that the standard of play was increasing from Year-to-Year, with some 1,600 English Schools and 23,000 players starting out for this year’s 2010/2011 Tournament. Team England International, Jenny Wallwork, part of the Nathan Robertson, Mixed Doubles combination, who are hoping to be selected for the London 2012 Olympic Games, was present to give support to the proceedings. “We gave it our best shot, most certainly and enjoyed the Day, and the ambience at the Sherwoof Forest Parcs, immensely. “I visited Center Parcs, Nottingham, in the Spring of 2009, with a Truro Girls’ Team, who finished 6/9 and Center Parcs, this time around, once more, provided excellent hospitality and facilities, including the sports hall and the catering hall. “Our gratitude is extended to the Company’s management and staff, including Mr. Colin Whaley, Sales and Marketing Director, along with Mr. Brown and BADMINTON England, as well. “A special word for the Penryn College Badminton Club, our fellow competitors, and friends in Kernow, who have also experienced a memorable season, under the direction of chief coach, Jon Wotton. “All day, my charges gave 100%, in an inspirational performance, in the National finals and I am so very proud of them all. “We couldn’t overcome the final hurdle, but to finish 9th Best School, in England, is a fantastic achievement. This has been an invaluable experience for the Boys and it will inspire them, undoubtedly, for their years ahead in Badminton. School Coach: Mr. Clif Morcom, Redruth. The WILSON Company sponsored the feather shuttlecocks. Tennis, Netball, Badminton and the RFU’s Daily Mail England School’s Under-15 Rugby final, against The Royal Grammar School, High Wycombe, Bucks. Well done, indeed. St Austell Bay Senior and Junior Badminton Clubs have achieved Badminton England Premier status and Sport England Clubmark Accreditation. Cornwall U17s Badminton took a great victory on Sunday by comprehensively defeating close neighbours Somerset 23-13 in their penultimate South West Counties League fixture at their “home” venue at Tregorrick Park St Austell. Sam Spencer - Truro College (Capt). Chris Grout - Launceston College. Tony Marshall - Budehaven School. Kynan Clarke - Truro College. Christian Jasper - Launceston College.Chris Cooper - Penryn College. James Gallagher - Wadebridge School. Beth Wotton - Hayle School (Capt). Beth Rich - Mounts Bay School. Abigail Logg - St Marys School Launceston. Hannah Roberston - Callington Sixth Form. Hester Luke - Mounts Bay School. Rachael Collard - Callington Sixth Form. In the singles the boys took 5 out of the 6 matches with a classy performance by Chris Grout at no2 . James making his county debut at no6 won well in two hard fought ends 21-18.21-18. Just rewards for a consistent approach at training over two years. His determination under pressure being the deciding factor. In the girls singles great wins for Hester playing at 3 in two straight ends ,Beth Wotton in two ends and Hannah winning a gruelling 3 ender at no6. This left the team with an 8-4 advantage going into the doubles. The boys continued their great season at this discipline taking 6 out of 9 games. Christian and Chris Cooper further cementing their partnership at no3 by taking two games with a great win against the Somerset no2 pair. The girls took all 3 against the Somerset 3rd pair. Beth and Beth making a critical contribution to keep the team on track with a fine win in two ends against the Somerset second pair, being more focussed and retaining the attack on a consistent basis. Our 3rd pairing of Rachael and Hester had a magnificent performance in taking the Somerset No1s to 3 close ends. Great tactical awareness by our girls. A scoreline of 18-12 in the Duchys favour going into the mixed. This is where the strength in depth of the team lies. New pairings throughout the mixed returned 5 wins from 6. The most nerve racking performance goes to Beth Rich and Kynan at no3,who in 3 ends 19-21.23-21 and 28-26 showed all those present just how much pride there is within the team. A wonderful game to finish a great match for Cornwall. This victory moves the team into a position to travel to Wiltshire next Sunday in good heart, with the aim of a 3rd place in the League still very much achievable. A big thank you to all the Grandparents,Parents and Brothers and Sisters of our players who supported the match. Kynan having the full complement of 3 generations of his family in attendance to give support. Thank you on behalf of Cornwall Youth Badminton to all the staff at Tregorrick Park for their welcome and support over a long season, this being the counties last competitive match at the venue for this season. Always a warm welcome and great facilities. Cornwall 1st team travelled away to Avon on Sunday to play their penultimate fixture of the season. Currently top of the table, but with West Glamorgan close behind and with games in hand, Cornwall needed a minimum of a 10-5 victory to take the title chase to the last match. James Whetter set the team rolling with a quick and clinical 21-7, 21-10 defeat of the Avon no.1, whilst Ross Lashbrook was unlucky to lose 21-18 in the third end of a closely fought battle. Jo Philp and Emily James took both the ladies singles to give us a 3-1 lead after the singles rubbers. With solid, attacking badminton, Emily and Jo comfortably disposed of both Avon pairs. Bronwen Wotton and Janet Santillo displayed an impressive performance to defeat their equivalent pairing in three hard fought ends, and were unfortunate to miss out against the first pair in the third end. The Avon men’s first pair proved to strong for both James and Guy Michell, and Tom Lyle and Ross. However, both Cornish pairs had comfortable wins over the second pairs which meant we were still in the running for our much needed 10-5 win. Tensions were running high as we went into the mixed doubles, needing to take at least 2 of the 3 rubbers to keep the title dream alive. James and Jo lost out in a tense three-ender to Avon’s first pair, and the pressure was on the remaining Cornish pairs to prevail. Cornwall 1st team will need to put in the performance of the season this Sunday 27th to beat West Glamorgan at Polkyth Leisure Centre, and gain a chance of promotion. Home support is very much needed! Match starts at 12 noon. Cornwall’s under 21 badminton stars were out in force at the weekend in a triangle match against Avon and Devon. The fixture held at St Peters School, Exeter is the third year the event has taken place and is good preparation for the Inter Counties Competition (ICC) held in April at Hatfield. The ICC is the pinnacle of colt badminton with over 30 counties competing. When the Duchy had arrived Devon had already beaten Avon 6-4 so it was now the Cornish’s turn to face the squad from Bristol. The singles started well with the Duchy winning 3 out of the 4 singles contests, Emily James, Bron Wotton and Josh Pearce all winning through. Ross Lashbrook was unlucky in his tie taking the Avon number one to three sets and just missing out 14-21 in the third end to a very fit and tricky opponent Horace Tse. In the Ladies doubles Emily James and Jo Philip just got run out in the third end 18 -21, while Bron Wotton and Daphne Luke changed tactics and took their absorbing match in three ends. So with a 5-3 score line going into the mixed, it was very much in the Duchy’s favour. Chris Glasson and Jo Philip devastated their opponents in two ends showing a quality team performance. Daphne Luke and Tom Lyle in the second mixed did not let the side down with a fantastic three ended victory. It went right to the wire but the Cornish duo took the last end 23-21 leaving a fantastic Cornwall overall victory of 7-3. This must have put Devon at unease having only got a 6-4 win against Avon. “We definitely had the physiological edge” suggested Team manager Kelvin Edwards. “The matches are out of 10 games, so I placed our strengths in the Devon match in just making sure we got 6 wins to take the tie” continued Kelvin. Sadly, and beyond the run of play Cornwall lost to Devon 3-7. Cornwall 60’s successfully maintained 2nd position within their league with a convincing 11-1 win over Avon 2 at Clevedon on Sunday 27th Feb.
Again without Mike Nancekivell, captain Brian Hannibal brought Bill Edgar into the side. This proved an excellent choice, with Bill securing victory in all his games partnering Tony Roberts in the mens and Celia Hillman in the mixed. Other successes came from Vera Nancekivell playing alongside Chris Marr and Brian with Phil Oland, while Pat Edwards who was partnered with Celia had one win and one loss. The four mixed games were closely contested but pleasingly, all ended in Cornwall's favour. The team are now looking forward to the final match of the season away to Wiltshire at Melksham on the 27th March.